By Pete Wiltjer, principal, PWMG, Inc. In an era where long-time B2B publishers have rebranded as data and information companies, how has the role of the B2B editor changed? Abe Peck , a senior director at Medill’s Media Management Center at Northwestern University, spoke at the ASBPE Chicago Chapter Spring Bootcamp to shed light on how the revenue model of B2B publications has shifted, and how journalists and other creatives can embrace the changes to find continued success. 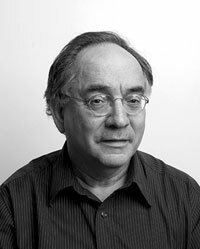 For nearly 20 years, the ASBPE Lifetime Achievement Award winner has audited a variety of B2B publications as part of his work as an editorial brand consultant. 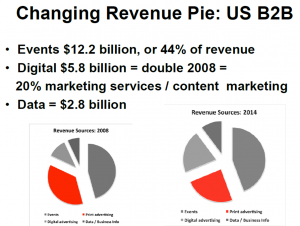 Peck showed charts indicating how the B2B publishing industry continues to evolve into a business featuring event, data and marketing even as it provides online and, with some diminishment, print platforms. Peck also cited one of B2B publishing’s longtime strengths as a continuing asset: the ability to recognize and be first on the scene to industrial, professional and technological changes in business today. This ability to nimbly identify new topics and markets for editorial coverage plays into the growing trend of disaggregation, the rise of social media’s impact for B2B journalists today and low barriers of entry that enable new competitors such as industry associations to quickly compete against established publishers with their own quality editorial products. He also cited some specific examples of publishers that have successfully pivoted away from a central print editorial focus and toward a multi-channel focus, such as Hanley Wood. Peck said this Washington, D.C.-based publisher made a strategic shift to a digital/data/events focus, despite running two successful 100,000 circulation print magazines. As B2B editors evolve into strategy partners for their publishers, Peck said they will be counted on to recognize and communicate the value of their work in terms of audience needs, data marketing, and even the ability to recognize new, transformative markets that would be worthwhile to report on. ASBPE, which is a free organization to join, offers a variety of continuing education and professional networking opportunities like the Spring Bootcamp in Chicago. Abe Peck says that while that the B2B publishing industry has evolved into a marketing and event management industry, the core product, print magazines, are still growing and viewed as a key component of the industry, though no longer at the center of its universe. The link associated with the above statement takes you to the MPA 2015 Magazine Media Factbook. All the data refers to consumer magazines, not business-to-business. Curious that the link takes you to consumer info when Peck is talking about B2B. However, Peck might be wrong in saying B2B print magazines are still growing. On Dec. 15, 2015, Folio: reported “13 new [B2B] magazines were launched, down from 47 last year….” based on data from MediaFinder. Do we need some clarification? Hi Robin, thanks so much for catching this. It was an error in the article and has been corrected!